And here we go again. One more game? Two more games? Good news for chess fans like @walterzuey: the world championship match 2014 is almost over. “I awake @ 5am even on Carlsen – Anand rest days. Maybe I should do something w/ my life”. Let’s go to game 11. @SilvioDanailov: “If Magnus Carlsen doesn’t win today,the whole match will be pretty disappointing.Nothing to remember really except the result”. @reachsvara: “Considering Magnus played sharp in game10, today he may do same. Both players confident playing other’s strong points”. @vinodharidas: “Don’t know if I want to watch Carlsen-Anand tonight. Can’t bear Vishy losing or drawing this one. Which is most likely with Black against MC”. Comeback? 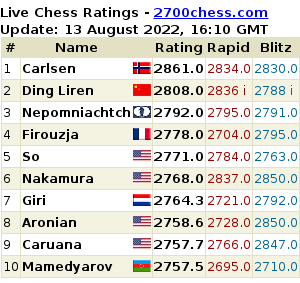 What do you think, @EinarGausel: “I think Vishy might give 1…c5 another whirl. 1…e5 will be a clear indication that his only goal is survival. @harrypillsbury: “Probably impossible. I’d really like to see a Benoni: Son of Sorrow2”. The game – Berlin ….again! @opiegonefishing: “Berlin Berlin Berlin Berlin Berlin Berlin Berlin Berlin”. Your blogger is happy with the Berlin, and takes his last chance in this match to post this great song by Fischer Z (the name, oh…the irony). No words. Playing in Sochi is a shame. Better go back to the game. @Vachier_Lagrave: “Very strange decisions by Carlsen from the very start up to allowing the b5 break. Now he will need a world of cleverness to save the day”. @GMLars: “23…b5! is a strong move but especially psychologically, showing VA is ready to go for it. Probably still about even, though”. @ChrisBirdIA: “I did wonder if the DGT folks were messing with us again once …Rb4 appeared on the broadcast”. @SuryaChess: “Very bold play by Anand.I am just not sure if this was needed at this moment.I hope I am wrong & Anand knows what he is doing”. @hansenchess: “Anand senses the urgency. However, his execution could be rusty since he hasn’t had enough sharp games this match”. @chesscampeona: “The Berlin in Game 11 is dead”. @Unudurti: “Throughout the match Anand created more chances but Carlsen was far more accurate in seizing his chances whenever they came”. @ellenoec: “Still shaking, so proud! World champion x2”. One last tweet for today by @kajasnare: “I have touched more levels on my emotional specter today than I did my entire high school career”. Attention: There will be an extra “Carlsen-Anand in Tweets-Game Over” edition of Chess in Tweets later this week. Stay tuned!